Costs associated with home staging services vary by the project. Some people stage their home themselves. They can save a good deal of money, but what they trade out is their time, energy and probably an inferior outcome. It's very difficult to stage your own home. The reason is that it is virtually impossible to remove your emotions from the situation and see the property as merely a "house" rather than your "home". So for many reasons it makes good sense to hire a professional stager and just pay the home staging fees they charge. If you still insist on doing the labour yourself there are handy self-serve guides available at Decorate-Redecorate. 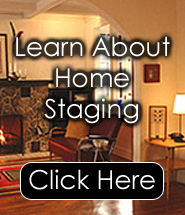 One such guide is called Home Staging for Yourself. Since it is a series of about 50 pages of tasks for every part of the home, you'll probably find that it leaves virtually no stone unturned when it comes to deciphering the right sort of tasks for every part of a typical home. Since professional home staging services are typically much less expensive than the sacrifice of the lost profits from a major price reduction, it even makes sense to hire a professional stager to handle the details for you. Then you can concentrate on organizing your move, as that part is already hectic enough. Some real estate agents will pay for all or part of a consultation with a stager. Before you choose your listing agent, check around to see who offers staging and who doesn't. Be very careful, of those agents who profess to stage the home themselves. They might know what they're doing and they often do not. Many will edit the home so severely it has no "soul" left in it. While it's good to present the property in a "less is more" style of decorating, one can get too antiseptic if not careful. At Decorate-Redecorate there is a huge list of trained stagers and re-designers all across the country. Homeowners are invited to make direct contact with any individual listed to inquire about their services. Take a few moments to check out all of the other valuable information you can find at www.decorate-redecorate.com. Whether you are interested in decorating and preparing a house, or finding new and wonderful ways to enhance a living space for the family and the fabulous parties you will be having, you will find exactly what you need in a home staging or interior redesign book online from Decorate-Redecorate.